As a travel writer, Jeff Greenwald has traveled across five continents. He has experienced the world in up-close detail, trekking in remote regions of the Himalayas, hanging out with Tasmanian Devils on the Australian coastline, and shopping for honey at the Medina in Fez. There came a point in his career when he realized that he had seen more of the planet than Marco Polo and Magellan combined. Still, he says no landscape is more beautiful than the American Southwest. I have not seen that much of the world, but after spending the past week roadtripping around the Four Corners area, I’ll take his word for it. Allison and I are on a sort of farewell journey before she leaves next month for an extended stay in Munich. Though we are repelled by the interminable track housing and strip malls that blight the west, the natural architecture stuns: when we woke up in Castle Valley outside of Moab, the sunstruck redrock seemed perfect as the Taj Mahal. At Arches National Park, I was convinced that “Landscape Arch” was the most beautiful thing I’d ever seen. When we practiced asanas in Canyonlands, the Needles Overlook seemed as sacred as the any ashram. Up a Wasatch canyon, the towering granite and running river brought us to life. Now in Telluride, the surrounding peaks silence us like the Sistene Chapel. Lest I get too romantic, against the backdrop of this unbelievable west, all the clumsy features of a real road trip remain. On the first day, we detoured far into the Alvord desert, coveting fantasies of hotspringing under the stars, only to find a lukewarm tub and hurricane winds. On day two, we plundered into the mud at a Nevada Hotspring, the van hopelessly waylaid. Fortunately, we were pulled out by a couple of miners on their way to work. 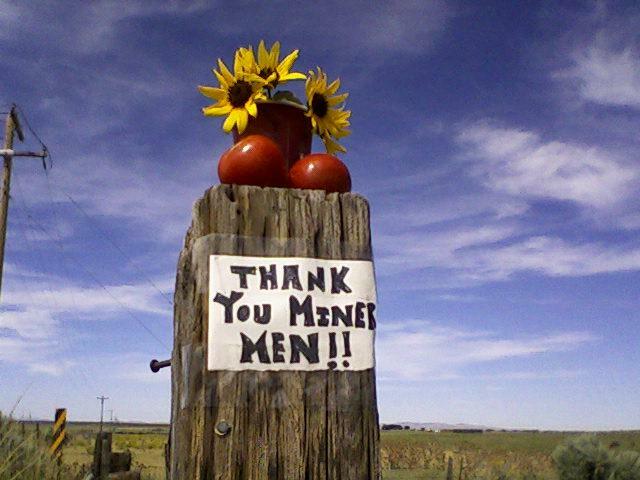 They refused our money so later we left them a bouquet of roadside flowers and a couple homegrown tomatoes. In between our rashes of giddy chatter there have been interspersed stretches of silence. At one point I was sure that Allison was purposefully disagreeing with everything I said. “I think this is the darkest place in the US,” I said of Natural Bridges in Utah. When I wanted to turn right, she insisted on left. When I pointed north, she pointed south. I wanted to take this trail, she wanted that one. One nigh after finishing a bottle of rose under the stars at Arches, I soliloquized about how awful it would be to get a DUI. That you could end up in jail. “That’s not true!” she crowed. I left my story unfinished and went to bed. Now in Telluride, we get along, but the mixed bag that is travel continues. The other day, I shied from a walk with a near stranger, only to find out later that it was Youssou Ndour, the Grammy Award winning Senagalese singer. We watched him perform last night and I am still kicking myself for not taking that walk. How I would have loved to have him teach me a simple song! All the same, Allison and I have had great food, good hikes, seen friends. No landscape, no matter how beautiful, can make everything perfect. It’s a cliche, but true: it doesn’t really matter where you are, you take yourself with you. So it is: against the backdrop of the Cretaceous epoch, between the upwellings of basin and range, at the place where the Paleozoic era gives way to the salt flats, our speck-like concerns persist and we fume, fret, get stuck, regret, argue, wonder, laugh, philosophize, and debate. We shuttle through emotions as diverse as the landscape.
. . . Which makes me think of the film I saw last night. In a park, underneath the glow of the big dipper, we watched an outdoor screening of Pirate for the Sea–the story of activist Paul Watson and his ship The Farley Mowat (www.seashepherd.org). While the raw depictions of seal clubbing and illegal whaling had me in one moment despairing, Watson’s direct action approach to combating these problems fired me up. By tangling-up the rudders of whaling ships, slicing their hulls, and otherwise getting in the way, Watson has preserved the lives of hundreds of whales and seals. Though radical, this is a kind of activism that I support. In the end, the movie left me wanting to find my way onto the Farley Mowat, to climb aboard to join the drama unfolding across the beautiful landscapes of this earth. Mid-summer finds me in a paraglider pilot’s paradise: living within a short glide path to the Woodrat Mountain landing zone. My place is nothing spectacular–a small trailer with bland decor but equipped with the essentials: a four slice toaster and high speed internet. A few decorations might make it feel more like “home” but I move so much these days I’ve nearly given up on such efforts; my painted sugar bowl and beloved brass horse figurines will remain indefinitely consigned to a storage unit until some distant and more settled future. For now, my need for decor is sated by sunsets and trees, which are easily viewable from the trailer’s wide deck and never in need of dusting or storage. Life here has a satisfying rhythm. Early mornings bring writing sessions on the deck, where I can glance up occasionally and watch gray squirrels twitch or watch deer tip-toe through dried madrone leaves. My flight radio is always switched to “on” so I can hear when the pilots have arrived and get up-to-the-minute flight reports from top-launch. It’s a short commute to join up with them and spend the late morning in search of gentle thermals. Afternoons here are hot and languorous, spent sidled up to the Applegate River reading West with the Night, which is female pilot Beryl Markham’s flight log-turned-eloquent travel narrative set in Africa. My own writing also fills the hours and out here, removed from the tempting social scene of Ashland, I am more productive than I have ever been. Around 6:00 the evening shift of pilots arrive to fly glass-off. The camaradarie is enough to scratch my social itch, and often friends come by the trailer afterwards for beer or mojitos, sometimes staying over to catch a morning flight. I write late into the warm nights, sitting out on the deck with large bugs crashing into my computer screen. I sleep in the outdoor bed, tuning out the mysterious rustlings around me. The place has its quirks: the electricity is haywire and the oven smokes, making my last pizza smell like a Les Schwab tire. In the bathroom the shower head sprays wildly in every direction. But, overall, this place combines the best of everything: flying, socializing, quiet time to write, nearby vineyards, organic farms, cool rivers. A great place to land.